Blind Pig's Extra Jimmies, a budget priced sampler is a superb introduction to the great Jimmy Thackery. Thirteen tastes of the maestro of electric blues guitar. Unlike The Essential Jimmy Thackery of a few years back, this one features selections taken from Empty Arms Motel (1992), the extraordinary Wild Night Out 1995), and Switching Gears (1998). A mix of originals and covers, Thackery impresses top to bottom. He has a somewhat gravelly voice that imparts the message more than effectively. His live cover of BB King's "You Upset Me Baby" showcases his command of the fretboard. He snakes, he moans, he picks with precision. Check out his cover of "Rude Mood." Not Stevie Ray, but its a damn sure Jimmy. "Lickin' Gravy," one of the standouts of the Thackery canon, is understated guitar over impassioned vocals before the guitar explodes to the forefront. His "Take Me With You When You Go" is a trip to zydeco country. Accompanied by Chubby Carier on accordian, this is a departure from the expected, but is a treat, nonetheless. The cover of Keith Sykes's "Love To Ride" is a soulful number that sets up the fiery "Trouble Man," one of the most incendiary of the Thackery book. This is guitar playing by a man in complete control. Following is the ballad "I Wouldn't Change A Thing" and the classic "Honey Hush." A few hundred folks have probably recorded this Lowell Fulson standard. Thackery's is among the best versions I've heard. Again, he's cajoling tones that only a master player could. The strings don't just bend, they seem to throw themselves at the guitar player. The closer, "Monkey," is classic. This one rocks so hard that the speakers threaten to fold into themselves for safety. Al Gamble's Hammond is a bonus, but Jimmy Thacker's guitar is the star of the show. If you weren't hip to Mr. Thackery before, this is a great jumping off point. There�s no doubt that every artist we listen to has some periods of their discography where their creative juices are more apparent in their recordings than others, and that�s just a part of a musician�s life. Some folks prefer the early Stones, while others prefer their later work, and on it goes. 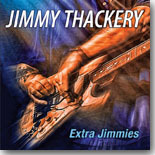 Blind Pig Records has decided to release a new Jimmy Thackery disc, Extra Jimmies, based on three out of print records from Jimmy�s early years around 1992 to 1998. The result is a very satisfying disc showing Jimmy�s guitar playing and vocals at their finest. The cuts are culled from Jimmy�s Blind Pig debut album, Empty Arms Motel as well as Wild Night Out and Switching Gears. Let�s give it a spin. The disc starts out with �Write If You Find Love� from the �98 album, Switching Gears, and has a very satisfying backbeat to start the show. Jimmy�s saying goodbye to an old lover and wishes her nothing but the best. He�s ambivalent about her departure --- that seems to be a part of loving her, but encourages her to see what she�s looking for and �write if you find love.� Interesting sentiment, Mr. Thackery. We move on to �You Upset Me Baby,� the only cut with drummer Mark Stutso on the lead vocal, and the band gets after it. �You upset me baby�like being hit by a fallen tree�woman what you do to me.� Mark�s apparently head over heels with this woman and Jimmy delivers a very tasty guitar solo to indicate the topsy turvy nature of the relationship Mark�s in. Will it end well? I wouldn�t bet the farm on that. Some very intricate bass picking by Wayne Burdette leads us into our next cut, �Rude Mood,� and we hear the band letting loose in a frenetic instrumental that allows everyone to shine. Jimmy�s fretwork is very satisfying and the guys are in high gear here. Al Gamble�s piano makes an appearance on the next track, �I Got to Be Strong,� and here we find Jimmy wrestling with the politics of a relationship he�s in. It�s not working out the way he�d like it to, but the right thing to do is rise about it, �you took all my money�you know that�s wrong�I�ve got to rise about it�I got to be strong.� Jimmy�s got the right attitude and moving on is the clearest course of action to take here. Our tempo finally slows down just a tad and the band offers its take on a George �Wild Child� Butler tune, �Lickin� Gravy� next. Filled with innuendo, Jimmy obviously has found a woman that�s almost too hot for him to handle. �You got me licking gravy, baby�cause your meat is too hot to bite.� I think we�ll leave that where it is and move on to �Take Me With You When You Go.� A staccato snare beat leads to Chubby Carrier�s accordion and the Zydeco mood is in full swing. Decidedly up-tempo, away we go. �Take me with you when you go�.oh, don�t you leave me here to dry�take me with you when you go babe�you know I�ll love you til I die.� Not sure Jimmy gets his wish but I like this tune a lot. Mellower, more emotive tone emanates from Jimmy�s guitar as the band tackles a Keith Sykes tune, �Love to Ride.� �Oh, I had a woman and she stole my money from me�oh I never knew�that�s what a good looking woman could be�oh, I love to ride.� Sometimes love has a price and Jimmy seems to be ok with the price he�s paying here. We move on to �Trouble Man� and this tune has more of a guitar rock feel to it. Jimmy�s offering himself as the solution to at least one woman�s problems��I got what it takes to me you feel alright�just give a call�I�ll do it tonight.� Jimmy�s got the time if you need the trouble. Up next is �I Wouldn�t Change a Thing.� and this cut is a beautiful ballad sung by Jimmy. �Did I do all the things I should�or did I rise above or knuckle under�oh but darling, when you look into my eyes�I know I�ve done alright.� Whatever else has transpired in Jimmy�s life, the love of this good woman has seen him through both the good and the bad times. Life hasn�t always been easy but they�ve made it through. A Lowell Fulsom tune, �Honey Hush,� is the next tune that Jimmy and the band tackle head on. �I can�t eat�.I can�t sleep�.I can�t rest in peace�cause baby�you talk too much.� This woman is driving Jimmy crazy and all he�s really craving is just a bit of peace and quiet. �Flyin� Low� is another cut with a decidedly rock feel to it and I like the energy of this cut. �I didn�t say a word�I stood there by that bar�he wouldn�t leave me alone�he said, �who do you think you are?� A fight ensued and Jimmy�s 38 ended the conversation, so now he�s �flyin� low.� It�s not clear if the police will catch up to Jimmy or not, but for now he�s free and on the road. This final cut, �Monkey,� from Jimmy�s earlier disc, Switching Gears, closes out this interesting compilation from Blind Pig Records. It�s a classic example of why Jimmy named his band the Drivers and they hit it as only the Drivers can. Hard driving, guitar blazing, it�s the perfect way to end this compilation disc. I would have liked to read more about the selection process for this disc, but the cuts included are very tasty and the fine folks at Blind Pig Records obviously took great care in putting this collection together. While I will always look forward to the next studio album from Jimmy or another of my favorite blues performers, Extra Jimmies will definitely see me through until then.